This April, take the opportunity to learn about four kinds of cancer and help spread awareness to your friends and family. April is dedicated to head and neck cancer, esophageal cancer and testicular cancer. While these cancers rarely affect children, it is possible. Cancer awareness months are a great time to learn more about the symptoms of cancer, but also the preventable risk factors. While many risk factors are unavoidable, tobacco use is one of the main risk factors for head, neck and esophageal cancer and it’s never too early to teach your kids about avoiding tobacco. This type of cancer includes all cancers that begin inside the mouth, nose and throat, meaning that many types of cancer fall under head and neck cancer. Approximately 3 percent of all cancers diagnosed in the U.S. are head and neck cancer. With head and neck cancer, the symptoms can vary depending on where the cancer begins. In general, a lump or sore that doesn’t heal, a sore throat that doesn’t go away, or difficulty swallowing are key symptoms to watch out for. Other symptoms include a swelling of the jaw, trouble breathing or speaking, headaches, ringing in the ears, blocked sinuses that do not clear, or persistent face, chin or neck pain. The most common risk factor for head and neck cancer is tobacco use. 85 percent of all head and neck cancers are linked to tobacco use such as smoking cigarettes, cigars or pipes, chewing tobacco or using snuff. Heavy alcohol consumption also increases the risk for head and neck cancer. Read more risk factors here. People over the age of 40 are more likely to develop head and neck cancer, and men have a higher chance than women for developing this cancer. Esophageal cancer usually begins in the inner lining of the esophagus, the tube that connects your throat to your stomach. It is a relatively rare cancer in the U.S., making up just 1 percent of cancers. Symptoms include trouble swallowing, discomfort in the middle of the chest, weight loss, loss of appetite, hoarseness and a chronic cough. Talk to your doctor if any of these symptoms are worrying you or if you have persistent symptoms. The risk factors for esophagus cancer are using tobacco, drinking heavily, eating few fruits and vegetables, having gastroesophageal reflux disease, being obese, and drinking very hot liquids. People over the age of 55 are more likely to develop esophageal cancer, and men are 3-4 times more likely than women to get this type of cancer. Although this cancer typically affects young and middle aged men, young boys can also develop testicular cancer on rare occasion. Testicular cancer in children and adults is highly treatable and usually curable. Learn more about testicular cancer in children here. Testicular cancer is an uncommon cancer; in 2015, the American Cancer Society predicts that 8,400 new cases of testicular cancer will be diagnosed and 380 men will die from it. However, testicular cancer is the most common cancer affecting men ages 15-35. The most common symptom for testicular cancer is a painless lump. Less common symptoms include a dull ache in the groin or other pain or discomfort in the area. Talk to a doctor if these symptoms last more than two weeks. There are very few risk factors for testicular cancer, but an undescended testicle, a family history of the disease, an HIV infection or being Caucasian put a man at a higher risk. Being taller than average is also a potential risk factor. One way to show your support and spread awareness for these cancers is to wear an awareness ribbon. 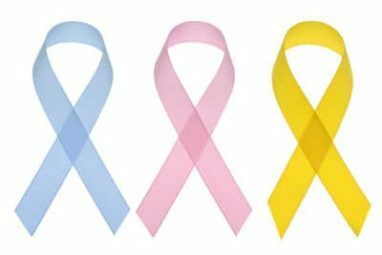 Head and neck cancer are represented with a burgundy and ivory ribbon, respectively, but they are often put together into a two-color ribbon. Esophageal cancer’s awareness color is periwinkle and testicular cancer is represented with an orchid colored ribbon (although some organizations use royal blue). If you are a dentist, you can play an important role this April by hosting a free screening event for head and neck cancer awareness month. Submit your event through the Head and Neck Cancer Alliance group, or the Oral Cancer Foundation. To raise awareness for testicular cancer, check out some ideas from the Testicular Cancer Society. You can also learn about events to raise awareness for esophageal cancer through the Esophageal Cancer Action Network. At Wheels For Wishes we feel it’s important to help spread awareness about cancer and medical conditions with our supporters. Our car donation program benefits Make-A-Wish and helps them grant more wishes for children facing critical illnesses. This April, consider donating a vehicle to help your local chapter of Make-A-Wish grant wishes for kids in your community. Whether you live in Seattle, Houston, Boston, or anywhere in between, you can make a difference just with your vehicle donation! To donate a car, please give us a call at 1-877-431-9474 or take a moment to fill out our online car donation form. You won’t regret it!